Today, we’re pleased to announce that tagging Facebook Pages is now available when publishing to Facebook from Sprout’s Compose window. Mentioning various Pages you run—such as other brands in your product portfolio or announcing a co-marketing initiative—has never been easier. And it may even help you reach a broader audience. 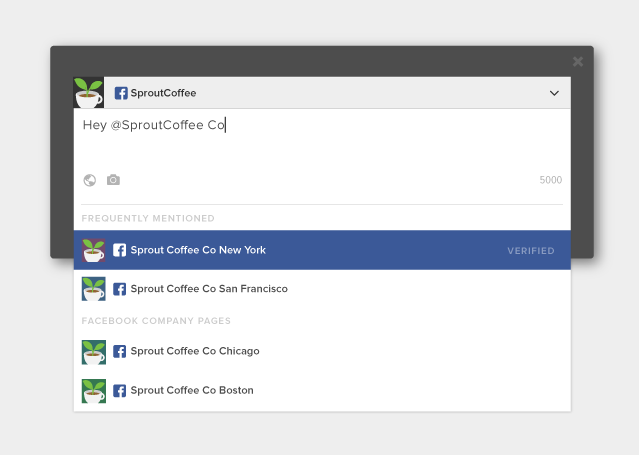 To tag a Facebook Page from Sprout’s Compose window, type the @ symbol followed by the name of the Facebook Page you would like to tag. The profile drop-down menu will dynamically update to refine your search results as you continue typing. Keep in mind that in order to tag a Facebook Page, you must be publishing to Facebook only from Compose. Navigating the Facebook News Feed with organic posts is no easy feat. In fact, it’s estimated that each time a Facebook user visits the News Feed, there is an average of 1,500 stories waiting to be seen from various friends, groups and Pages. Facebook is constantly updating their News Feed algorithm, Edgerank, to make sure that the most relevant stories appear in each user’s News Feed. Tagging another Page that is relevant to yours gives your post an opportunity to reach and be seen by a broader audience—not only your fans but also those that Like or follow the Page you’re tagging. While Facebook is a great place for friends to connect and brands to communicate with their followers, sometimes businesses themselves like to engage with each other there too. Whether announcing a major co-marketing initiative or simply citing your source when sharing third-party content, tagging a Facebook Page is the perfect way to engage another Page. What’s more, brands that manage separate Facebook Pages for regionally specific audiences or multiple retail locations can use Facebook tagging to provide customers with a more localized and relevant experience. Whatever your motivation is for tagging another Facebook Page, you can now do it when publishing from Sprout. Stay tuned for more updates to Sprout’s publishing tools and Facebook management tools, and as always, let us know if you have any questions or feedback.